But for a really good reason! The newest STAMPtember release is live and it's fantastic. WPlus9 and Simon Says Stamp have teamed up to bring you Saying Hi! 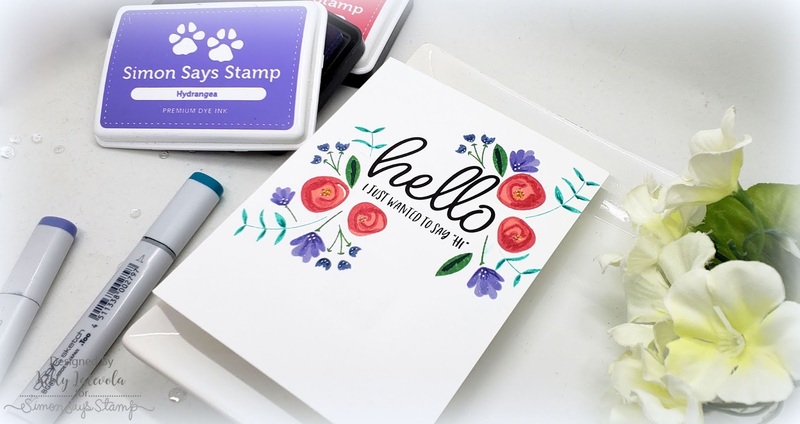 This cute layered stamp set has a ton of possibilities to create really quick and cute bouquets . 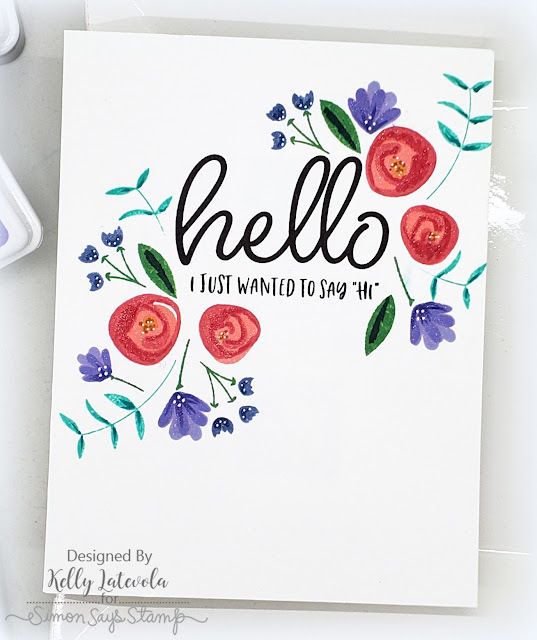 Which is what I did to accent this beautiful script hello. 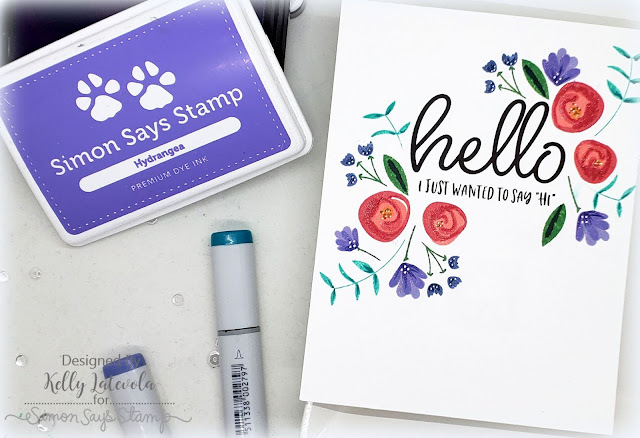 I don't typically gravitate towards solid stamps but I have a few "go to" ways to use them in a way that works with my style. I went for a simple combination of flowers and leaves that still lets the sentiment be the star of show. 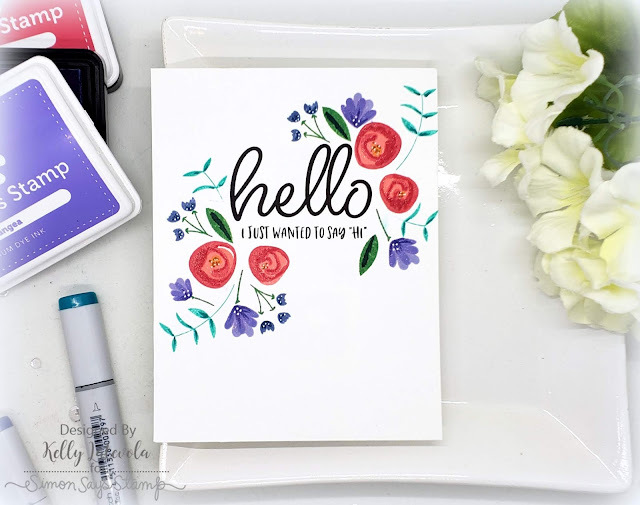 I started by stamping my sentiment and then my largest flowers. Once they were down I moved on to filling in the largest leaves. Adding the smaller flowers and accent leaves. The accents don't match perfectly but they have the same elements so everything still works together nicely. I wanted to add a bit more shading so I pulled out a few Copics and went to work. I added some clear Wink of Stella and a couple white accent dots and called it a day. It's really simple but I love the way it came out! I did do a video but don't watch it if you want to "hear" about how I made the card. Do watch it if you want to hear a story about pirates bahaha. If you love it go grab it because once it's gone it's gone. The card is gorgeous Kelly and stays gorgeous even when you tell almost nothing about it LOL. I love the pirate story. I think they dress up so they can have a talk with beautiful girls like yourself. Thanks again and hope to hear soon more from you. Wonderful, colorful card. Kelly, I LOVE your stories!!! Oh my gosh you & your girl friends would gel so well with me & mine, I thought we were the only daft ones out there but you lot sound so much fun. Lol keep it going girls it's a must. Now as you say side note, great card, simple but so pretty, as if people don't watch you for the stories !